Info: The Camillus Erie Canal Park, established in 1972 is near the location of the midpoint of the Erie Canal. Camillus Erie Canal Park is a nice little park, free, with a nice museum (also free from what I could tell), a large steam engine exhibit, and a paid boat tour of the canal through that section of canal and of course the trail. The trail is part of the Erie Canalway Trail. From the park eastward is a nice fine-gravel trail (a little over two miles one-way, four both ways) that ends at Warners Road/Route 173. This trail has many benches, shelters, a nature trail (where I believe you can see remains of an earlier canal), and a fully restored aqueduct. From the park another grass surface trail travels along the opposite side of the canal the same length of the opposite trail. – either trail can be accessed at either end. Going west from the park is a continuation of the trail along the canal that goes to Jordan and then to Weedsport, this trail is around 15 miles long. The Jordan end has a nice park, remains of an aqueduct, and a garden and park and you must travel a short distance on a lightly-traveled street. At Weedsport you must also travel a short distance along a street where you can watch for the trail on the right, which goes a short distance and ends. Beginning of the trail, looking east. The museum and Sims store. a bridge to the trail and a feeder canal. One of the parks near Jordan. Erie Canal section in Jordan. Biking along the Erie Canal near Camillus. 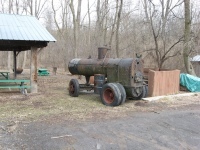 Directions/Location: 5750 Devoe Road, Camillus, NY 13031 – Camillus end of the trail, Village Park in Jordan, Laird Road and McDonald Road and some other locations along the trail. Trail Distance: Heading west from the park is around 15 miles to Jordan. A little over two miles heading east. Built on Former Railroad Bed: No, built on canal towpath. For More Information: Park website. Facebook Page. aquaduct, Camillus, canal, Erie Canal, Jordan, museum, park, tow path, Towpath. Bookmark. Comment sent to us by visitor MLS – “The Erie Canal trail in Camillus from Devoe Rd. to the shooting range is need of weed control. The tall weeds have totally taken over the path. One person even was cut by one of these weeds, they are impossible to avoid. Not sure who maintains this path but it needs a good weed whacking.